Tabbing or divider sets as they are more commonly known are a convenient and practical solution to the issue of adding sub-sections to your text pages. Our print finishing tabbing department have years of experience in producing divider sets in varied and complex sets. Using substrates as diverse as card, polypropylene and rigid PVC, the print finishing tabbing department can convert your requirement into a usable and durable filing medium. Divider sets can be produced in as many tab sections as required ranging from single tabbed dividers to sets of 500 tabs, Celsur can also personalise your divider sets using our versatile range of printing options such as foil blocking, silk screening and litho printing. The print finishing tabbing department also have an array of tab styles available, enabling you to choose the best format to improve the impact your product will have on your clients. 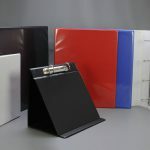 Over the many years we have been producing tabbed page dividers, we have seen many variations in our customer’s requirements. Indeed tabbed dividers are not just tabbed dividers! They are seen as a great way to share information, share your brand or advertise. We can provide a product design that is personalised and unique to your requirements, a service to suit your needs.